Earlier this year I read William Kent Krueger's [b:Ordinary Grace|15803059|Ordinary Grace|William Kent Krueger|http://d202m5krfqbpi5.cloudfront.net/books/1358264094s/15803059.jpg|21587729]. It was the first book I had read by Krueger so I was anxious to get my hands on another one of his books. 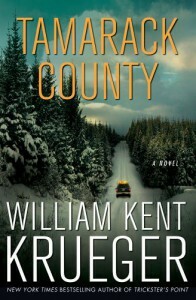 Tamarack County is Krueger's latest release, and it's part of his Cork O'Connor series.Overall I'd have to say this was a middle of the road book for me. Some of it was from coming into the series late, but some of it wasn't.Like most adult mystery series books, the main story of Tamarack County is stand alone. I didn't need to have read any other Cork O'Connor books to enjoy the plot or the mystery aspect of Tamarack County. I did feel like I was missing out on the back stories of Cork's family and his love interest, though. There was also some Native American culture I can only assume was explained in previous books. That being said, someone who has read all of the series thus far will probably appreciate not having it rehashed for them. I could also probably read the next book in the series now with less issue.Now for the part that had nothing to do with it being a series book. Even though Tamarack County kept me engaged as a reader, there were times I felt like I was being told about the good the stuff after the fact instead of experiencing all of the action myself. I also think some things were supposed to shock me, but they either fell flat or I simply saw them coming.This isn't to say I didn't enjoy Tamarack County because I did. There is a quality to Krueger's writing that I really enjoy. I may even go back and start this series at the beginning. I have no doubt folks who have been reading the Cork O'Connor series will enjoy this installment; I just wish I had started out earlier in the series.